Does pendalhaven work on a 1/1 creature that is being buffed by a lord? Do you have a way to consistently deal with Blood Moon ? It's not looking like it, so I would recommend Engineered Explosives , Krosan Grip , or counterspells like Daze . Maybe one or two basics could be good to provide the extra colors you'd need. 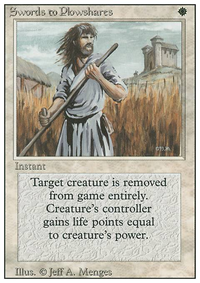 Life from the Loam is a possibility for you to get more land cards at record speed, plus you can dump more lands into your graveyard (for more fun!). 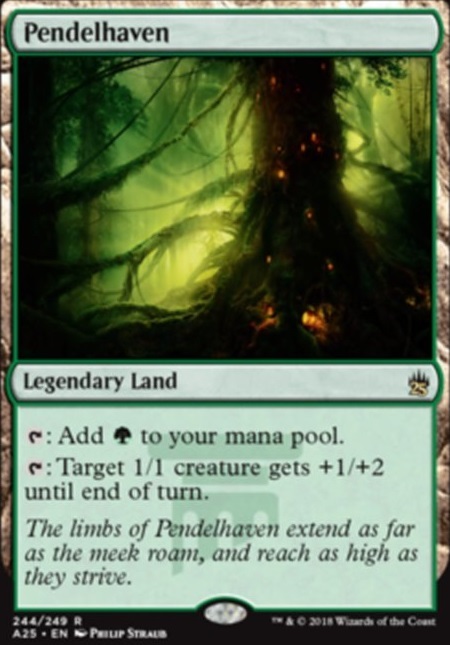 Pendelhaven , if used judiciously, is an extra boost for your manlands. Plus, it's green. 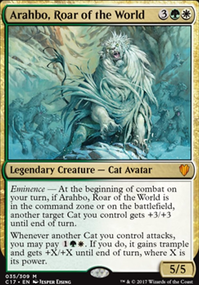 I commonly see Karakas in sideboards or main decks, because a lot of creatures running around that can cause problems are legendary. While off color, it's maybe not a bad idea for the bonus effect. I don't like Temple of the False God in here. I'd think Ancient Tomb might serve you better... or maybe run a copy of Urborg, Tomb of Yawgmoth . Its not much but whynot go for 6 forests and 1x Pendelhaven its the insane value to get a 2/3 Arbor Elf to end games! I like it. I've used Canopy Cover in the past and often found it lackluster but I was using a 2 color build. 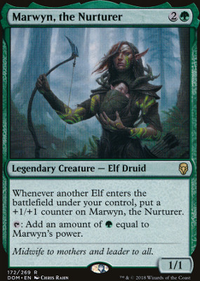 Manabase wise, I agree with main boarding a Dryad Arbor . I'd also add a second Pendelhaven and 4th Inkmoth Nexus . Sideboard, definitely look at Spellskite and Heroic Intervention can be a nice surprise to survive a board wipe. I think a lot of the mainboard changes I would make would be personal. I've always had better luck with vines of groundswell but again its what works for you. I would bump Ichorclaw Myr up one and Necropede down one. With 4 Rancor , on Ichorclaw Myr it can make people more hesitant to block. Honestly everything seems good here except the mana base. Like you can make do with the Birds for now, but start saving for those Nobles. The problem I see are 3 lands. Island and Flooded Strand . I highly disadvise any land than can only tap for Blue, as your primary color is Green. 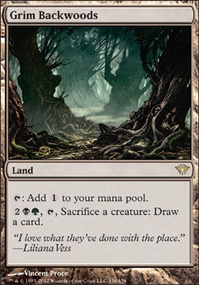 Some 2 land hands are a lot worse if you have Island and Inkmoth Nexus , but this would be perfectly fine if that land could tap for Green. I would swap it for Pendelhaven number 2. Flooded Strand can only get Breeding Pool , and sometimes 2 life makes a difference so I would switch it to 2 more Wooded Foothills to get Forest or Dryad Arbor just in case. I also recommend Shapers' Sanctuary as I said in the comment on my decklist page. Other than that it seems good. 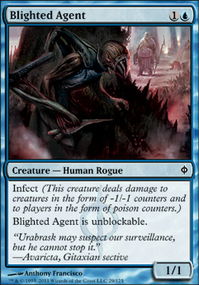 Nice to find other Infect players roaming about so have an upvote. Happy poisoning! I've been testing Pendelhaven and it's very good. I'm gonna try 2, but more than that might cause mana issues if more than one come up. Mana can be tight with a bad draw using only 22 lands. Inquisition is extremely cheap removal. It can be pretty decisive early game, but Abrupt Decay is pretty good here too. Thoughtseize is strong, but a little problematic for burn and aggro matchups. Mutagenic Growth is quite good but it would be replacing Rancor or Might of Old Krosa both of which are also very good. 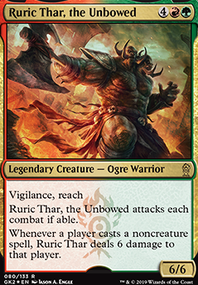 It has a surprise and early game advantage over Might, whereas Might could mean more damage/protection, and Rancor sticks around and is hard to get rid of, and trample is a game winner too. I might run Vines of Vastwood in place of Blossoming Defense though. It's main use is defensive, and for that purpose they are both 1 green. The +4/+4 might give it better versatility. There's no room for Tainted Strike for what probably amounts to a gimmick, though it could warrant testing. I think you're right about Assassin's Trophy , but Pendelhaven might have issues due to the number of non-1/1 creatures, and due to the number of cards that make the creature not 1/1 anymore. It's probably be worth putting in anyway, but I am concerned about getting too vulnerable to Blood Moon .